The side plank is one of the best core exercises you could do. It is extremely simple to perform, yet very difficult to master. While there are many side plank variations you can do, there are several ways you can do it incorrectly as well. This post will cover that and more. Many people over exaggerate the side plank by raising their body more than they need to. This increases the lateral flexion of your spine and defeats the purpose of the exercise. Only raise your body enough so that it is in a neutral position at the end range. Conversely, you should not let your spine sag either. This inevitably starts to happen as you begin to fatigue. If you can no longer maintain a neutral spine and hip position, then it is time to end the set. Squeezing your glutes during the side plank is what will ensure that your pelvis remains in an optimal position during this exercise. If you get lazy, you will fall into one of the above patterns to try and maintain a straight spine. What if side planks are too difficult for you? There is one simple thing you can do to make this exercise easier. You do not need to perform side planks on your knees. Instead of stacking your feet on top of each other, simply stagger your feet on the floor. The wider your feet, the easier the exercise. Over time, begin narrowing your feet more and more until you can perform them with your feet together. Side planks with rotations is a great way to add a dynamic component to this exercise. Simply raise your top hand up into the air directly above you, and then slowly lower that hand down towards your armpit. Continue going through this rotation for at least 5 repetitions per side. It is important that you do not allow excessive rotation of the spine while performing this exercise. I still want you to maintain your core tight and your glutes activated. This is an advanced version of the side plank that forces you to balance and support even more of your own bodyweight. From the standard side plank position, simply lift your top leg away from your bottom leg. You will instantly feel an increase in difficulty level. Maintain this position for at least 5-10 seconds. The other simple thing you can do is add a dumbbell to increase the difficulty of the side plank. Simply balance a dumbbell on your side by straddling it on top of your oblique muscle. If you can hold the position with excellent form for at least 10 seconds, increase the weight. Do You Recommend Performing Side Plank Dips/Hip Lifts? Side plank dips are when you pulse your hips up and down while in the side plank position. I do not recommend this exercise as the purpose of the side plank is to build isometric strength in the oblique muscles. This is the ability to resist motion at the spine. 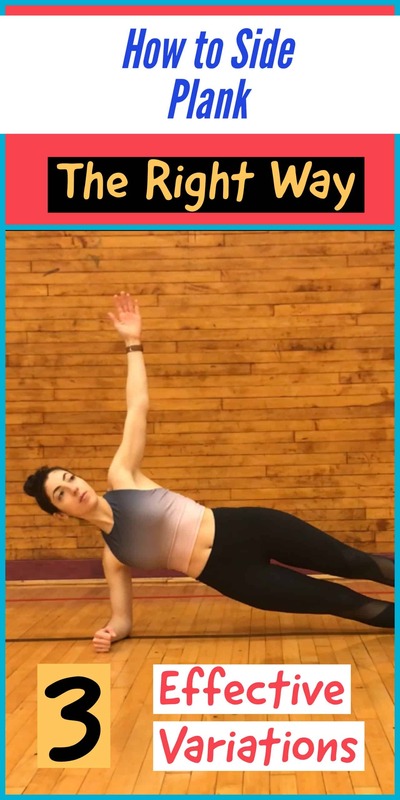 There are plenty of other exercises you can perform to strengthen the obliques in a dynamic motion such as windshield wipers, or you can perform side planks with rotations as demonstrated above. Do You Recommend The Side Plank Crunch? The side plank crunch is when you bring your top knee to make contact with your top elbow while in the side plank position. In essence, you are performing a ‘side crunch’ by flexing laterally. I do not recommend this exercise because it is forcing you to do two exercises in a mediocre fashion. When performing the side plank, you are trying to strengthen the oblique that is closest to the floor. Once you begin adding complex movements such as crunching the top oblique, you begin losing sight of what the exercise is supposed to do. Attention will be taken away from the bottom oblique and defeat the purpose of the exercise. Are Side Planks For Abs Or For Love Handles? The side plank trains the entire core musculature, however, it targets the obliques (or love handles as some people say) more. This exercise by itself will not make you ‘lose your love handles,’ what you choose to eat or not eat will have a much bigger impact. HOW CAN I INTEGRATE THE SIDE PLANK INTO MY TRAINING?